From time-to-time we like to take a look at constitutions in action in other parts of the world. This week a referendum was held in the Kurdish region of Iraq to kick off a push for independence from Baghdad. We thought it was a perfect time to examine the Iraqi Constitution and look at whether Kurdish independence is possible. Do you want the Kurdistan Region and the Kurdistani areas outside the administration of the Region to become an independent state? 5,338,000 people were eligible to vote and somewhere between 70% to 90% cast ballots. Voters could choose ‘Yes’ or ‘No’ and early indications show that the ‘yes’ vote achieved more than 90%. The Iraqi Prime Minister Haider al-Abadi earlier denounced the referendum as unconstitutional. This week he stated that the referendum threatens the peaceful co-existence among Iraqis and is a danger to all in the region. He has vowed to take measures to safeguard the nation’s unity and protect all Iraqis. Somewhere between 25 and 35 million Kurds live in the mountainous regions across the borders of Iraq, Iran, Syria, Turkey and Armenia. They are a distinct community united through culture, language and race. For more than a century they have been calling for the creation of a Kurdish State and immediately after WWI this looked likely to happen. However, when the borders were eventually drawn up after the Great War, there was no provision made for a Kurdish state. The Kurds have been fighting for independence ever since. Kurds make up nearly 20% of the population in Iraq and at times have been a persecuted minority. This Constitution, upon coming into force, shall recognize the region of Kurdistan, along with its existing authorities, as a federal region. Legislation enacted in the region of Kurdistan since 1992 shall remain in force, and decisions issued by the government of the region of Kurdistan, including court decisions and contracts, shall be considered valid unless they are amended or annulled pursuant to the laws of the region of Kurdistan by the competent entity in the region, provided that they do not contradict with the Constitution. So, the Kurds have their own government and laws which are protected by the Iraqi Constitution. They also have their own military, the Peshmerga, who have been assisted by foreign governments (including ours) in the fight against ISIS. Some people believe that because of this, now is the right time to push for independence. While others believe that because of the instability in the region the momentum for an independent Kurdish state should wait. Those that opposed the referendum being held included the USA, the UN and some European countries. 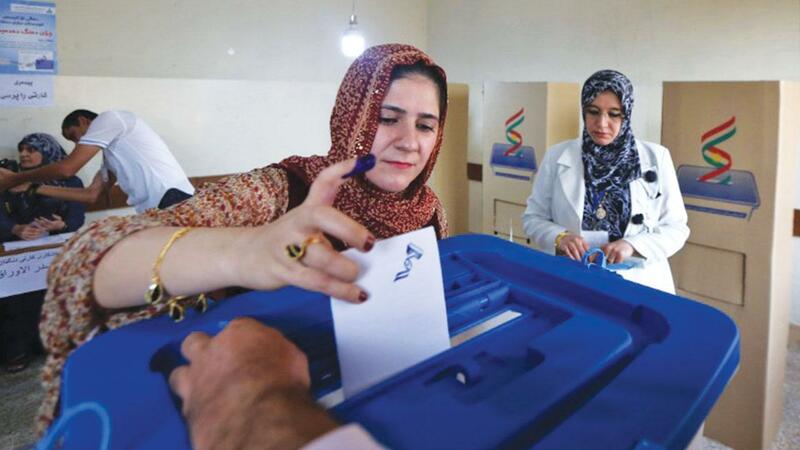 While not opposed to Kurdish independence, they believe that the referendum should have occurred after the 2018 Iraqi election. Turkey, which also has a large Kurdish population of their own are vehemently against an independent Kurdistan, as is Iran. Iran are so incensed that they have closed the borders to the Iraqi Kurdish area and suspended all flights in and out of the region. The governments in both of these countries believe that an independent Kurdistan in Iraq may set an example that could lead to the Kurds in Iran and Turkey stepping up the campaign for independence. Does the Iraqi Constitution allow the separation of the Kurdish region? Like many countries that form a constitution after war, the Iraqi Constitution is very long and detailed. This is very different to the Australian Constitution which was written in a time of peace and is one of the shortest in the world. The Kurdistan Regional Government has made a case for secession from Iraq. The result of separation could mean that the 2005 Iraqi Constitution may have to be dissolved. We are not ready to discuss or have a dialogue about the results of the referendum because it is unconstitutional. The referendum is not binding and was meant to be a legitimate mandate to negotiate with Baghdad and neighbouring countries over the secession of the Kurdish-controlled region from Iraq. The KRD have stated that Kurdistan voluntarily formed a union with Iraq in 2005 and gave limited powers to the federal government. This union was ratified through a referendum and the Constitution was implemented. The KRD point out that the Iraqi Constitution deliberately does not define territory, make the union permanent, or exclude secession. Article 110 of the Iraqi Constitution outlines the exclusive powers of the federal government. Included is foreign policy, formulation and execution of national security, fiscal and customs policy, regulating standards, citizenship, regulation of broadcast frequencies and mail, budgets, water policies and the census. Article 115 of the Constitution states that any powers not stipulated as federal exclusive powers belong to the regional governments. The federal Iraqi army….failed to protect Christian, Yazidi and Kurdish citizens from genocidal assaults by ISIS, and the Iraqi government followed this devastating failure of duty by refusing to facilitate the appropriate resourcing of the Peshmerga….The official Army has also ceased to be representative of Iraq. The Republic of Iraq is a single federal, independent and fully sovereign state in which the system of government is republican, representative, parliamentary, and democratic, and this Constitution is a guarantor of the unity of Iraq. As you can see one of the fundamental principles is that the Constitution is a guarantor of unity in Iraq. Does this mean that a federal referendum would need to be held for the secession of the Kurdish region? The referendum result is non-binding, but it can be used as an indication of public opinion of the number of Kurds who wish to secede. Kurdish separation would require a great deal of negotiation with the Iraqi Federal Government and perhaps a federal referendum. It could result in the Iraqi Constitution being dissolved. An independent Kurdistan would also likely require the support of the international community to ensure a smooth transition.